If y’all are looking for some southern eats in NYC, venture over to the East Village where “Top Chefs” Janine Booth and Jeff McInnis have created a quaint atmosphere at Root & Bone with vintage furnishings and, of course, delicious food. The spot is not yet a year old, but has gained an impressive following and four stars on Yelp. I went with the classic Frie d Chicken and Waffles. The chicken was super crispy and really well seasoned with a good helping of both white and dark meat. The waffles were covered in melted cheddar and served with whiskey maple syrup. Yum, yum, yum. Just look at that melted cheddar. My friend Chelsea opted for the “Skrimps & Grits.” Yes. SKRIMPS. Apparently skrimp = shrimp in southern talk? Indeed a perfectly good southern meal for being in New York. I’d give it a 7 out of 10. 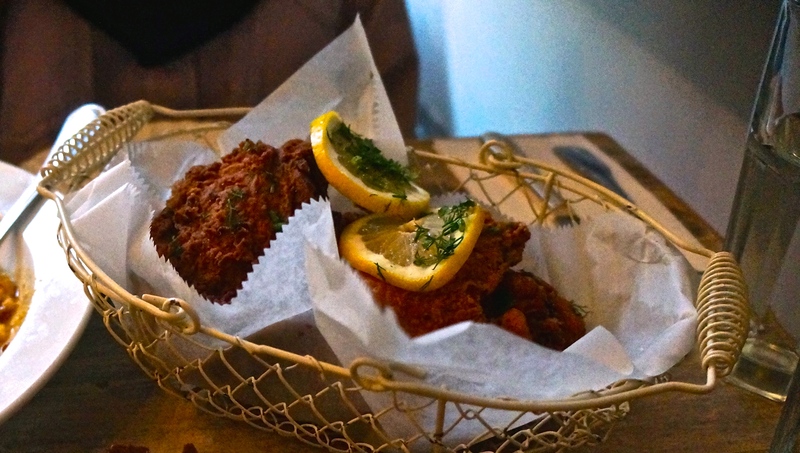 Think you’ve had the BEST fried chicken in NYC? Where!? Let me know and I’ll venture there next!